The captain wishes you a pleasant flight. Thank you for traveling with us. Does Osman Hadzic moonlight as an airline pilot or this is just a suit he uses to lure in unsuspecting women in search of high altitude adventure? There’s no denying that when you put a schmuck in a uniform you make a respectable and erotically charged man who commands respect. Look no further than an average police officer. Capt. Osman understands this. He has seen other great leaders of men and a number of dictators who had donned uniforms in lieu of real substance. Gold braided epaulettes, a gold lined pocket protector and a double buttoned shirt – these are parade ground accessories. Osman Hadzic is a high flying lover not a warrior. He’s coming in for a crash landing though. 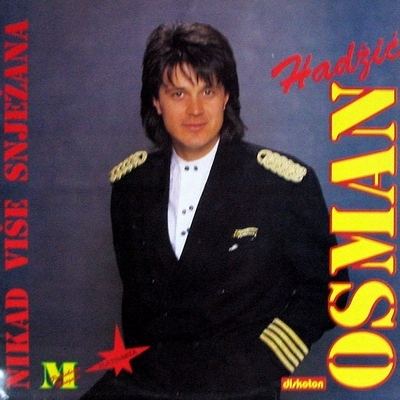 This entry was posted in Records and tagged Bad record covers, bosnia, folk, osman hadzic. Bookmark the permalink.